I think that, as a middle aged woman, I'm (old) expert enough to know what's unflattering on my shape, so, when I picked these pants and dress, I was conscious of the fact that so much volume in my mid section is not flattering anyway. It would be better to wear this dress over leggings, or to wear these pants and a shorter top. But sometimes I want to wear something different, I want to mix some prints, wear a dress over wide leg pants, whatever!. It's not always the most flattering outfit which finally hits the road! There's also a weather issue involved in this outfit, something like 'How to keep on wearing your summer clothes when weather is not being collaborative?'. Well, I'll share my (totally surprising) tip: layers!, lots of them!. I worn a big shawl-scarf over summery clothes, in a chilly morning (12ºC/53ºF) and I walked to work feeling very comfortable and warm. If weather keeps on playing this game, I would wear my winter jackets over sundresses, tights with my sandals, and would mix lots of seasonal pieces!. Probably it would still be some hot days, but autumn is coming! And I'm linking Fake It Until You Make It, which shares lots of inspiration! Creo que, siendo una mujer madura, y debería ser suficientemente vieja experta para saber qué es lo que no favorece a mi figura, así que, cuando escogí estos pantalones y este vestido, fuí perfectamente consciente de que tanto volumen en mi parte más ancha no me favorece en absoluto. 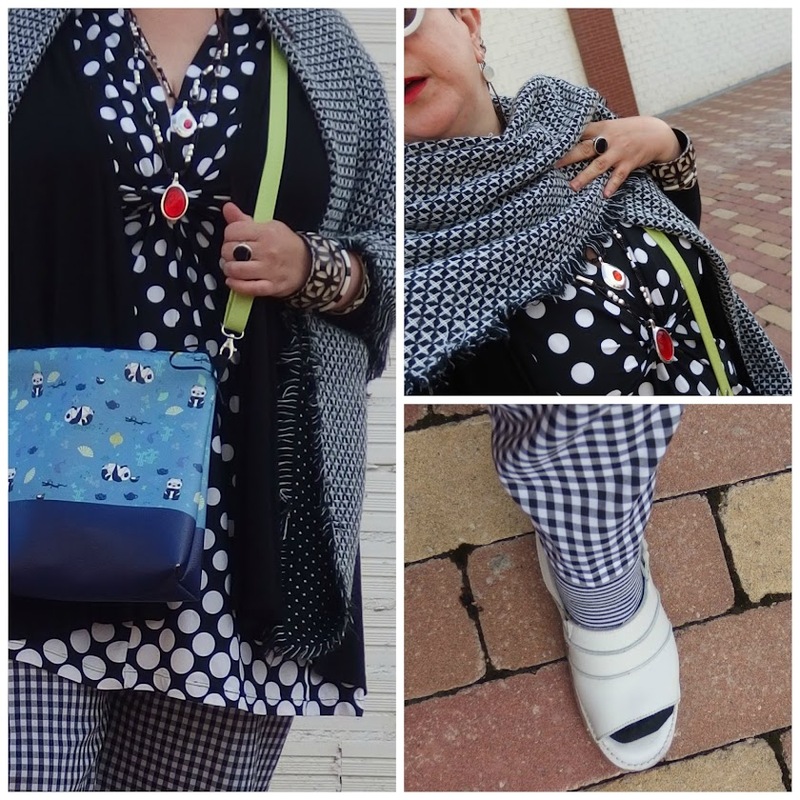 Hubiera quedado mejor el vestido sobre unos leggings, o los pantalones con una blusa corta y entallada. Pero a veces me apetece algo diferente, mezclar estampados, ponerme un vestido sobre unos pantalones anchos, lo que sea. Así que no siempre es la opción más 'favorecedora' la que acaba triunfando. También está el asunto climático, que podría titularse: ¿Cómo seguir llevando ropa de verano cuando el tiempo no acompaña?. Bueno, yo tengo mi truco (totalmente nuevo y sorprendente! ): capas y capas superpuestas!. Me eché esta enorme bufa-manta por encima de mi ropa de verano, en una mañana bien fresquita (12ºC) y me eché a la calle tan cómoda y a gusto. Si el tiempo sigue jugando a este juego, me voy a poner chaquetas de invierno encima de vestidos ligeros, medias con sandalias y montones de otras mezclas estacionales. Seguramente queden todavía días de calor, pero el otoño ya está cerca! Y enlazo a la pandilla de Fake It Until You Make It, que comparte un montón de inspiración! Thank you so much for linking up this post! I think the dress is very flattering over the wide trousers because it is nipped in at the bust. The mixture of patterns is "on point".... beautiful and vibrant as always! Why do we feel we need to apologise for being not the thinnest we can be? I think your outfit is glorious! And so celebratory of black and white. Oh yes, I agree with you, no need to apologise for our fashion choices, for our own style/personality/aspect. Never! Love your look in these pictures. I'm with Samantha. I like the wide legs with this dress. And I love how you're going to get your summer pieces working into cool weather. Yes! The red pendant is perfect with this. Charming outfit (polka dots and checks ❤️) AND flattering. The tunic is adorable and the empire waist accents your hourglass figure. Also love the long cardigan and the scarf. I just knew that everyone would tell you that it in fact IS flattering! :) I am glad that they do, and I am with them too! You are such a master of layers - I think you did this brilliantly, everything here works together so well: the shapes, the patterns, the color scheme... Maybe in a different color scheme or with solid pieces, it wouldn't be flattering, But here, it totally is! At the same time, I know what you mean and I support your message. We don't owe to anyone to wear only what flatter our bodies. We can be creative and free, and some outfits hide our best assets, so what? There are other ideas behind clothes too, not only to flatter our bodies. I really like the pattern mixing and the dress-over-pants look. I don't always wear what is most flattering to my shape either. Sometimes I just really love how something feels, or the colour, and I'll wear it even though it may not be the best choice for my shape. I like this outfit Monica! I think it's very flattering on you because layering is fabulous, mixing prints/pattern is fabulous and your shawl and accessories are wonderful. I would describe this look as very, very interesting; if I didn't know you and saw you on the street I would think to myself 'that is a very interesting and fun looking person'. I do that too - sometimes I don't always wear the most flattering shapes together or even solo. I love these wonderful patterns! Wonderful outfit! I am very much in favour of non-flattering outfits whenever one fancies.